2016-01-06 - You've Been Warned! I know you all want to win, so I'm going to let you in on a little secret. Ok, it's not really a secret. In fact, it's not a secret at all. To be frank, I've been saying it for years. If you want to win at trivia, it helps if you are smarter than everyone else on the planet, but in the event that you're not..... if you follow us on the social networks, you will be given MULTIPLE opportunities for bonus points. 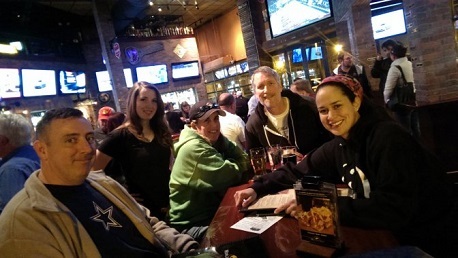 In fitting fashion, those bonus points proved to be crucial on Wednesday at World of Beer Arlington. In Game 1, we saw the return of our PubGuys Trivia League Runners-up, The Return of the Prodigal PLC. As they are known to do, they made their presence known right away with a perfect opening round. The Mouseaholics stepped up their game and rallied back to force a tiebreaker between the two juggernauts. What was not lost in all of this was the inspiring performance put on by the Trivia Wannabees. As one of my favorite teams each week (I know, I love you all, but they really are great), I love watching them succeed and on any other night, they would have been in the money in both games. Back to the tiebreaker. When it all settled, The Return of the Prodigal PLC proved their worth with a near bullseye concerning the years humans have been inhabiting Palo Duro Canyon. For the Power Hour, statistically our most loyal team, Quiz in My Pants proved they were tired of watching everyone else walk away with gift cards, so they promptly stormed out of the gates and captured a lead they would not relinquish. In the end, it would have been a tie with the Mouseaholics, however, proving their importance, a bonus point pushed Quiz in My Pants ahead and into the triumphant position. Anything else I happen to think of....you'll need to stay tuned. With all that, it seems like I should be awarding around 6 bonus points each week. Instead, I award 2-3 on average. Step it up folks! Happy New Year and CHEERS! !